“I’m not very creative” doesn’t work. There’s no such thing as creative people and non-creative people. There are only people who use their creativity and people who don’t. Unused creativity doesn’t just disappear. It lives within us until it’s expressed, neglected to death, or suffocated by resentment and fear. So I was asked to create a logo for an Indonesian restaurant in Jeddah. I kinda like it! Hehehe. What d’ya think? So yes, I applied some henna on my hand 🙂 I always have some stock of henna with me and I love doing it! So here it is I present you my own very creation. Hihihi. 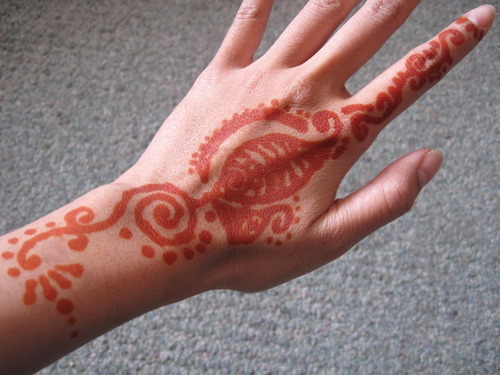 It wasn’t the best henna design I created to be honest. 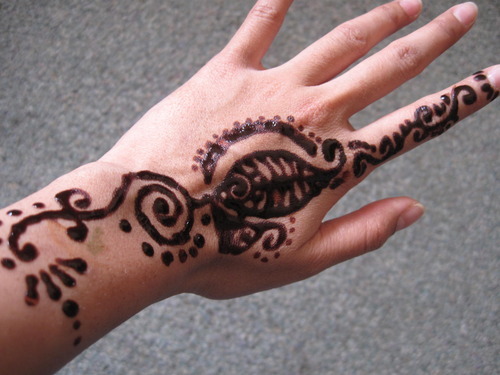 The henna paste was not good enough — it was too watery. Therefore, it was really hard to preserve some details of the design. Because in the end, everything blended together. So the leaf part looked quite awful. It looked like a fish now. The color seemed to be good though! I think this henna would last quite a long time. I didn’t wait until it dried completely though, so I’m sure the color would be much darker had I wait for more minutes or hours.